Of the hashes provided, only three samples could be found in public malware repositories. All three had been submitted from Poland in recent weeks. Here we’ll analyse these files as well as shed further light on the watering-hole exploit kit code itself, in the hope this aids further detection and network defence. Most likely, this file is an encrypted configuration file, which is decrypted and loaded by the sample #1 (srservice.chm). This DLL loads, decrypts and injects the 'CHM' file into the system lsass.exe process. This file is a command line tool that accepts several parameters such as encrypted file name and process ID. The tool reads and decrypts the specified file, and then injects it into the specified process or into the system process explorer.exe. The file fdsvc.dll is an encrypted file, successfully decrypted into a valid DLL (MD5: 889e320cf66520485e1a0475107d7419) by the aforementioned executable fdsvc.exe. Once decrypted, it represents itself as a bot that accepts the C&C name and port number(s) as a string parameter that is used to call the DLL. The parameter is encoded with an XOR loop that includes XOR key cEzQfoPw. Multiple C&C servers can be delimited with the '|' character and port numbers are delimited from the C&C servers with the ':' character. The binary protocol is custom. For example, during the "ustanavlivat" (handshake) mode, the bot accepts 4 bytes, which are then decrypted. The decryption is a loop that involves multiple XOR operations performed over the received data. Once decrypted, the 4 bytes indicate the size of the next data chunk to be received. The next received data chunk is also decrypted, and its contents checked to see whether it's one of the backdoor commands. For example, the "poluchit" command instructs the bot to receive the file, and the "pereslat" (send) command instructs the bot to upload the file. The received "poluchit" command may also contain a URL, marked with another transliterated Russian word "ssylka" (link). In this case, the remote file is fetched in a separate thread. If a received data chunk contains the command "vykhodit", the bot quits its backdoor loop. The bot implements the SSL/TLS protocol, and is based on a source code of "Curl v7.49.1". Hence, it is able to transfer files via HTTP, HTTPS, FTP, SMTP and many other protocols, with full support of user/password authentication (Basic, Digest, NTLM, Negotiate, Kerberos), proxies and SSL certificates. In spite of some 'Russian' words being used, it is evident that the malware author is not a native Russian speaker. "ustanavlivat" omitted sign at the end, verb tense error "ustanovit'" or "ustanoviti"
"poluchit" omitted sign at the end "poluchit'" or "poluchiti"
"pereslat" omitted sign at the end "pereslat'" or "pereslati"
"derzhat" omitted sign at the end "derzhat'" or "derzhati"
"vykhodit" omitted sign at the end, verb tense error "vyiti"
Another example is "kliyent2podklyuchit". This is most likely a result of an online translation of "client2connect" (which means 'client-to-connect'). In this case, the two words "client" and "connect" were translated separately, then transliterated from the Russian pronunciation form into the Latin alphabet and finally joined to produce "kliyent2podklyuchit". Such a result may look impressive to the bot's author, but would be difficult to understand for native Russian speakers. Here we provide an example of translating the word "client" in Russian - the word "kliyent" here only demonstrates phonetic pronunciation, not how it's actually written in a transliterated form. When formed using the Latin alphabet, it would actually be written "client" or "klient". Due to such inconsistencies, we conclude that the Russian language is likely used as a decoy tactic, in order to spoof the malware’s country of origin. During the investigation of the watering-hole incident, the owner of a compromised website shared with us a malicious implant that was added into the site, presumably by using an exploit against JBoss 5.0.0. The script is called view_jsp.java and is accessed from the watering-hole website as view.jsp. This script is responsible for serving cambio.swf. This begins the profiling and filtering to identify potential victims. For example, the script then checks to see if the client's IP is black-listed. If so, such initial request is rejected. Next, the script checks if the client’s IP is white-listed (i.e. targeted). If not white-listed, it is also rejected. Hence, unless the visitor’s IP is on the attackers’ list, the script will not attempt to infect their machine. This helps the infected websites stay undetected for relatively long period of time, as they only serve exploits to the selected targets. Once the script accepts the incoming request and finds the form's pagenum value is 2, it reads other fields from the submitted form and decides which exploit to serve back to the client. At the time of writing, the exploit kit known to serve back two exploits, for Adobe Flash and Microsoft Silverlight, though these could be expanded upon as needed. where 2016-0034 identifies the Silverlight exploit, and 0000-0001 is the Flash exploit. If the script detects that the submitted form contains a non-empty version of Silverlight browser plugin, it will generate and serve back a Silverlight exploit. If the submitted form has a non-empty version of Adobe Flash browser plugin, the script will generate and serve back the Flash exploit. 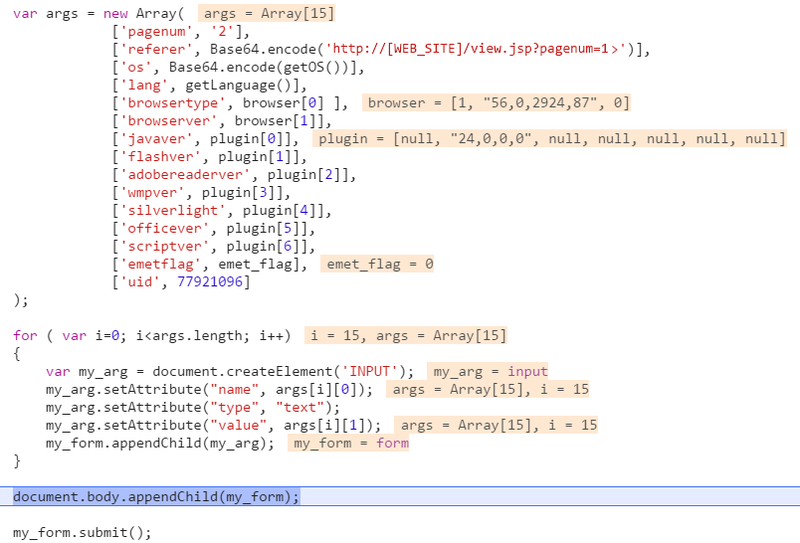 If the client has both plugins loaded within the browser, then the script will serve the Flash exploit only. NOTE: the script only serves the Flash exploit if the browser is Internet Explorer. Note that the pagenum parameter of the URL has now advanced to 3 (third step of the view.jsp execution). This URL string will be embedded by the genExp_00000001() function into the body of the shellcode. By looking into the decompiled cambio.swf file, its ActionScript reveals that the SWF file indeed expects 2 parameters: Health and shell. By knowing the value of Health parameter, it is now possible to use it as an XOR key to decode the orinBin blob within the SWF code. The code decrypts the blobs with RC4, using "littleEndian" as the RC4 key. These blobs also turn out to be SWF files that contain the SWF exploit code. As such, it is obvious that the word "dummy" has been translated into "chainik". However, the word "chainik" in Russian slang (with the literal meaning of "a kettle") is used to describe an unsophisticated person, a newbie; while, the word "dummy" in the exploit code is used to mean a "placeholder" or an "empty" data structure/argument. In the same way, it is likely the word "farm animals" was originally used to represent "a beast". Yet, it has been translated into a word that is only synonymous to "the beast" in a certain context. As a result, they have used the words "farm animals" across the shellcode instead of "beast"; which makes little sense. As in the case of sample #5 (fdsvc.dll), it is likely that this loose Russian translation, evidently performed by a non-Russian speaker, is intended to spoof the malware origin. The SWF's ActionScript then loads and executes the shellcode that was passed to the SWF file. As with the Health parameter, by having access to the server-side code it is now possible to analyse what shellcode has been served to be executed via SWF file. The shellcode consists of 2,372 bytes of a Win32-code (in fact, 2,369 bytes padded with three zero bytes to make it 4-byte aligned). • The first part of the shellcode (818 bytes) creates a hidden process of notepad.exe. It then injects the second part of the shellcode into it using the VirtualAlloc() and WriteProcessMemory() APIs, and finally it runs the injected code with CreateRemoteThread() API. Once decoded, the second part of the shellcode reads the URL embedded at the end, then downloads and saves a file under a temporary file name, using the prefix "tmp". This way, the 2nd part of the shellcode downloads a binary from the same gateway script as before. pagenum=3 means it's a 3rd step – a step of serving the next chunk of the shellcode. To understand the next step we need to go back to the gateway script to see how it processes the pagenum=3 request. When the script receives a pagenum=3 request, it checks the 's' URL parameter ('status'). Initially, this parameter is set to 2 ('s=2', as seen in the aforementioned URL embedded into the SWF exploit). The first file is likely a valid ICO file, is 318 bytes in size, and its contents are not encoded (hence the reason why the shellcode skips the first 318 bytes, and only decodes the rest). The second file is a 3rd chunk of the shellcode, and its contents are encoded. This way, the encoded URL becomes an integral part of the 3rd part of the shellcode – same way as the 2nd part of the shellcode was appended with a URL. Once this 3rd part of the shellcode is served back to the shellcode that runs on a client side, it will skip the first 318 bytes, decode the rest and execute it. This will invoke another binary download – this time identified with the status value of 3 ('s=3'). The new binary is generated by view.jsp script and is almost identical to the 3rd part of the shellcode. The 2nd file is now different, and the URL is no longer appended. The reason why the new binary does not need the URL embedded may be that this binary contains an actual malicious executable, detached, decoded, and executed by the shellcode, thus leading to a full compromise of the victim. NOTE: At the time of analysis, the ICO/DAT files were not available. Hence, their contents remains unknown. Here we have analysed further files from the recent watering-hole attacks directed at Polish financial institutions and others. Evidently, the Lazarus group are continuing their campaign targeting banking networks. Their watering-hole mechanism is fairly sophisticated – its multiple stages are designed to complicate analysis of its malware distribution, and at the same, stay undetected for as long as possible. Because of the previously disclosed attribution links, the group are also resorting to some trickery. Through reverse-engineering, we can see the use of many Russian words that have been translated incorrectly. In some cases the inaccurate translations have transformed the meaning of the words entirely. This strongly implies that the authors of this attack are not native Russian speakers and, as such, the use of Russian words appears to be a 'false flag'. Clearly the group behind these attacks are evolving their modus operandi in terms of capabilities – but also it seems they’re attempting to mislead investigators who might jump to conclusions in terms of attribution.